Surf Maroc was our base of operations during our Moroccan surf trip. One of the top-rated places to stay in Taghazout, Surf Maroc has everything an on-the-move surfer can ask for: tasty family-style feasts to fuel up, surfboard rentals, transportation to and from the waves, and, most importantly, a crew of hosts and guides who make you feel at home—even though you’re thousands of miles from it, chasing waves on the coast of Northern Africa. 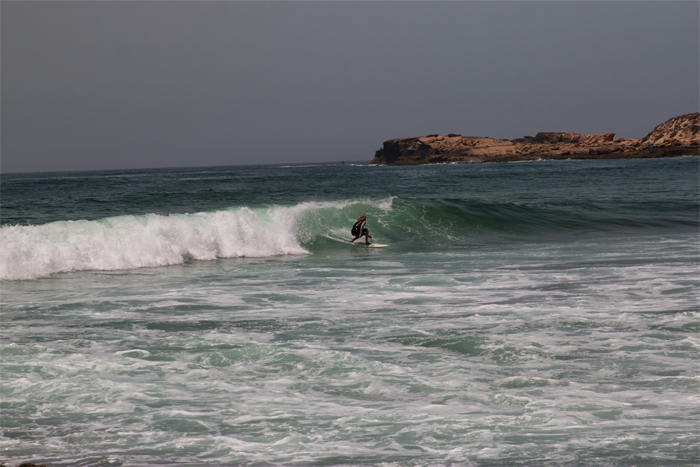 Surf Maroc has a few different options, ranging in price, privacy, and luxury. After checking out the apartments — which are spacious and welcoming but more attuned to the needs of long-term travelers — we opted for the Taghazout Villa, which combines the privacy of individual rooms with the joys of communal living. After a long day of surfing, we looked forward to returning to the tiered, open villa to stretch out in a rooftop yoga class, lay out in the Moroccan style lounge, or kick back in the hammock. Overlooking the Atlantic, the Villa offers a spectacular panorama of the coastal town of Taghazout. Next door to the Villa, Surf Maroc runs a small surf shop with a decent selection of rentals, ranging from performance short boards to log-sized foamies perfect for beginners. If you don’t plan on bringing your own board, you should be able to at least find something that floats. All of Surf Maroc’s guides are capable surfers who speak fluent English, and they’re happy to help you catch your first wave or drive you to the best break of the day. We had a blast with Youssef, our guide for the week, who always had a grin on his face whether we were bumping ‘90s hip-hop as he accelerated down the highway, surfing waves at Cathedral Point, or catching a soccer game at a local cafe. While you don’t need a guide, they’re beyond helpful when it comes to navigating the nuances of this stretch of coastline. We recommend staying at the Villa—if only so you can take advantage of the spread. For breakfast, fresh-squeezed juices, coffee, and tea wash down traditional Moroccan flatbreads and stews crowned with sunny side-up eggs. The main dish changes daily but yogurt, granola, and a healthy mix of nuts and dates are a welcome constant in the mornings. Dinner at the Villa is a treat as well, with heaping platters of cous-cous, cucumber salads, and savory tagine (Morocco’s most renowned simmering stew). Despite the delicacies that were breakfast and dinner, our favorite meal would have to be lunch, however, as the Villa chefs put together a bag lunch worthy of its own Food Network special. Nothing like a spicy chicken baguette sandwich, a refreshing, minty Moroccan salad, and fresh fruit to fuel the fire in between surf sessions. 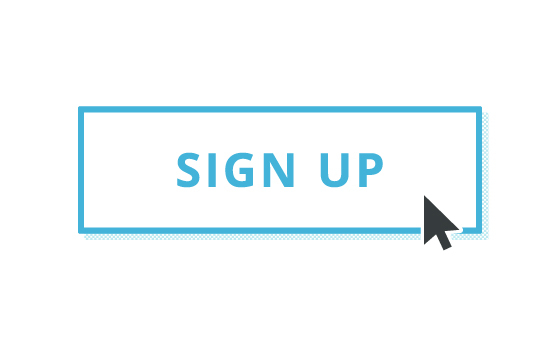 The surf and yoga package includes a few nights of yoga classes in the Villa, but you can attend the class even if you aren’t staying at the Villa. 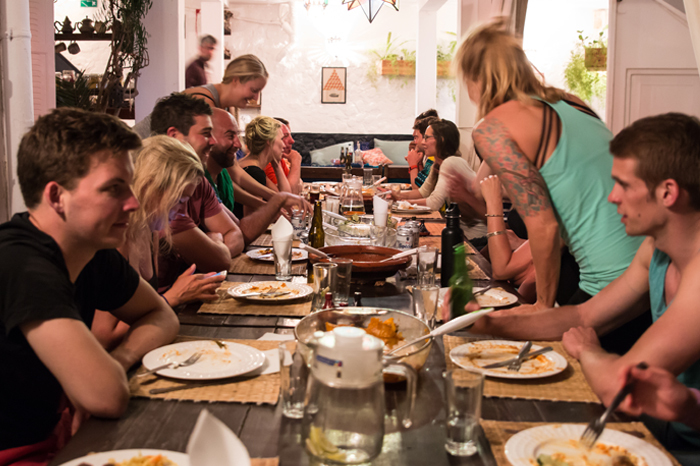 Surf Maroc also offers a full-on Yoga Surf Retreat for those who want to give equal priority to both disciplines. 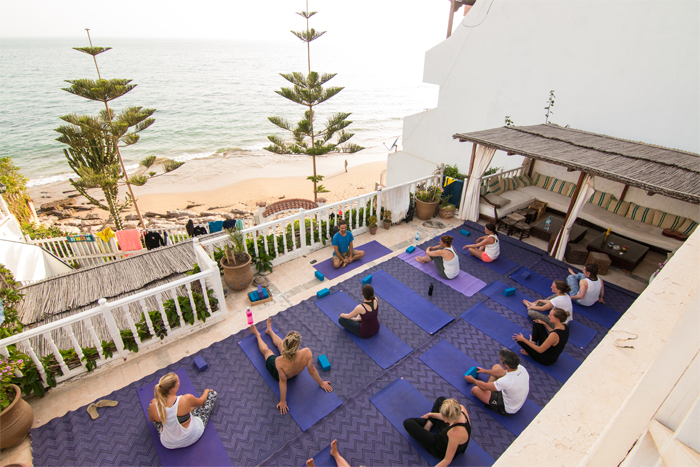 Set on the main Villa rooftop deck, the yoga classes were some of the best we’ve ever attended. Jo and Taylor, the yoga teachers, were talented yogis to be sure, but the most memorable aspect of practicing yoga at Surf Maroc was the atmosphere. 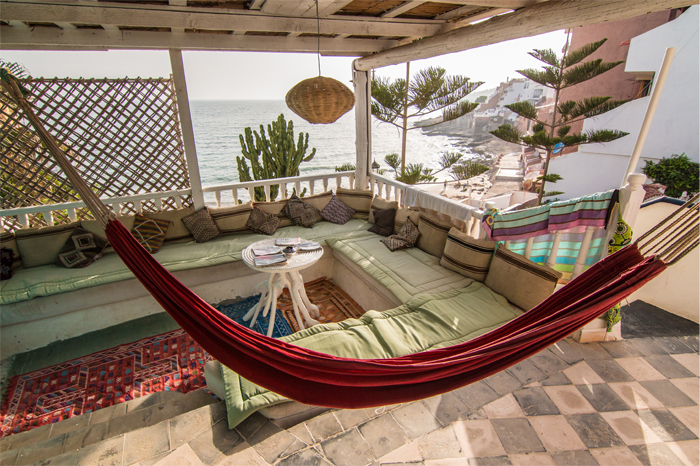 Just picture this: you’re stretching out as the sun dips across the sea and the evening’s onshore winds ripple across the rooftops of Taghazout. Behind your yoga teacher, the glowing Atlantic Ocean spreads across the horizon. Local kids dash after a soccer ball on the beach. Your muscles are sore from surfing, and a restorative yoga class is the cherry on top of an already amazing day of shredding. Nothing short of paradisiacal. Is Lib-Tech Making the Best Travel Surfboards Known to Man?